Some have interpreted this to mean that Christian Scientists should follow the law and be vaccinated, while others have argued it simply means Christian Scientists must report contagion to the proper authorities. 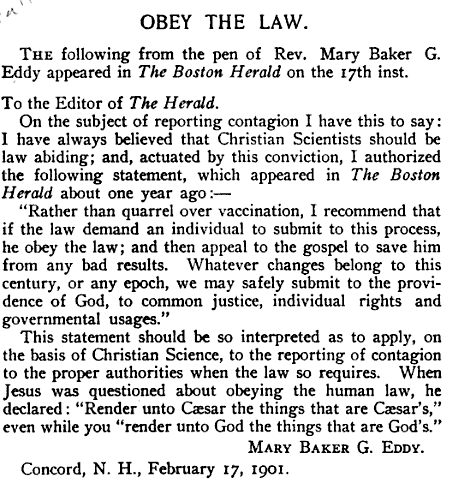 Mary Baker Eddy teaches contagion is unreal, and Christian Science Nurses are not trained to recognize disease, so I’m not sure how this is supposed to happen (2). There is the oft-talked about Christian Science Church Seeks Truce With Modern Medicine, from the NYTimes, May 24, 2010 (3), but it is fluff and PR. In June 2011, the young-hip-cool Time4Thinkers had a piece entitled “Let’s get over the judgement thing” (4) which cited a passage in Science and Health, and attempted to claim that Ms. Eddy was okay with people using doctors if they felt the need. It is okay, we won’t judge. If you actually read the rest of the Chapter XIII, Teaching Christian Science (5), you’ll see Ms. Eddy was actually saying is that they’ll learn the hard way how wrong they are, try to be nice about it, but distance yourself from them. I could take a number of the passages from Science and Health out of context to create the appearance that Christian Science is okay with people seeking medical aid, but context is very important. A diary kept by Calvin Frye, Eddy’s personal secretary, revealed that she was addicted to morphine, and had a lifelong dependence on morphine pills and shots. Miranda Rice, a friend and close student of Eddy claimed to have treated her hundreds of times with morphine. Rice wrote “I know that Mrs. Eddy was addicted to morphine in the seventies. She begged me to get some for her. She sent her husband, Mr. Eddy, for some; and when he failed to get it she got it herself. She locked herself into her room and for two days excluded everyone.” However, biographer Gillian Gill notes that the prescription of morphine was normal medical practice at the time, and that in her view Mary Baker Eddy was at no time addicted to morphine. “Addicted” or not, she used morphine. The excuse that “prescription of morphine was normal medical practice” is hollow at best, as Ms. Eddy regularly rails against morphine and other treatments of the day (7). The Christian Science Church has known for many years that though Mary Baker Eddy spoke vigorously against doctors and drugs as well as vigorously affirming the unreality of pain, suffering, and disease, she herself was frequently attended in her declining years by doctors, received injections of morphine for the alleviation of pain, wore glasses, and had her teeth removed when they became diseased. However, despite this, the Christian Science Church insists upon the validity of Mrs. Eddy’s teaching, which deny the very practices Mrs. Eddy herself exemplified. I think the passage from Kingdom of Cults sums it up nicely. Ms. Eddy could not live up to her own “spiritual standards,” perhaps because they were, themselves, unreal. Not unattainable, or unrealistic, but simply UNREAL. I happen to agree, a good Christian Science Practitioner can be an excellent ally when it comes to depression and anxiety, but for everything else, unless the “healing” is instantaneous (10), I’d use a bit of caution. Neither Christian Science or a placebo will regrow a limb. Very few Christian Scientists will submit to having the efficacy of their prayers tested in a laboratory setting, and to the best of my knowledge, The Mother Church frowns upon such testing (11). It is also worth noting that most Christian Scientists do not ever receive an official diagnosis, so they often speculate on what they might have been healed of based on vague symptoms — appendicitis or constipation? Several symptoms could be the same, so claim a healing of the more impressive one. So what is a Christian Scientist to do? I strongly feel, if the healing is not instantaneous — the way Jesus is purported to have healed — you should seek medical care. Unlike many Christian Science Practitioners, most doctors will not judge if you choose to seek a medical path and choose to simultaneously pray about it. Use prayer to allay your fears about turning to the medical community for help. Have you seen this documentary? http://www.escapefiremovie.com/ The medical world isn’t always the answer. Anonymous, Thanks for the link. I agree, the American Healthcare system is not perfect, and I have had my share of negative experiences when dealing with them. However, the medical system is evolving, they no longer cling to outdated notions like the idea that cucumbers are the cause of cholera. The big deal in all this is that there has to be a scientific distinction between the power of the placebo effect and the power of prayer. It isn’t an easy process since so many Christians and Christian Scientists have fears about modern science. Look at the behavior of the Creationists, for example. I’ve often wondered about the placebo effect vs. prayer, somewhere I’ve started a collection of articles that talk about it further. It is on my list of things to explore further. For me, the important thing is that it (be it prayer or placebo) works consistently every time and offers repeatable results. During my time in CS, the only consistent, repeatable results I experienced from prayer were that of it failing, over and over to heal, which resulted in a fair bit of dental work made all the more unpleasant by the initial insistence that I would not “need” local anesthetic while my teeth were being drilled into. The medical system may not be perfect, but well-placed local anesthetic worked consistently every time. Interesting. I’m curious, how does CS stand on the idea that it might be their god that put modern science here for us? You’re approaching the problem all wrong: in CS none of this material stuff is real, we are in the Adam dream, eventually we will wake to know our True Spiritual Selves — like the Matrix only weirder, this post: https://kindism.org/2013/01/06/twisted-spoons/ touches on that a little. Thanks for the link and explanation. you’re welcome! 🙂 https://kindism.org/2014/01/05/christian-science-gaslighting/ and https://kindism.org/2012/12/11/guest-post-the-last-straw/ and searching for “unreality” also address some of the issues.